An earlier post noted that one of the survivors of the Virginia Tech tragedy is Derek O'Dell, president of the chess club at the university. A new Chess Life Online article recounts Derek's part in saving the lives of several of his classmates. You may have seen him in some of the early television reports mere hours after the mass shootings occurred. Chess Life Online and the USCF have announced that the 2007 Samford Scholarship winner is IM Josh Friedel. Josh is well on his way to becoming a grandmaster, with two GM norms under his belt. A brief Chess Life discussion of Josh appears here. Josh also had a number of comments for me after the initial U.S. Chess School session from January 2006. You can read about his experience there in my March 2006 Scholastic Chess column at ChessCafe. 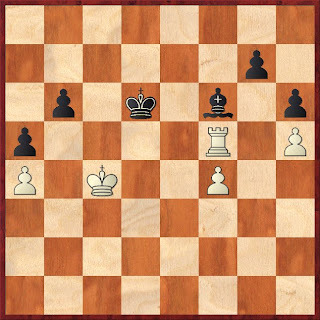 This position is presented in Efstratios Grivas' latest "A Chess Odyssey" column at ChessCafe. 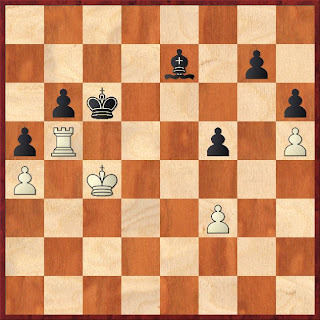 Is this the closest thing to a checkers triple-jump that you'll see in chess? 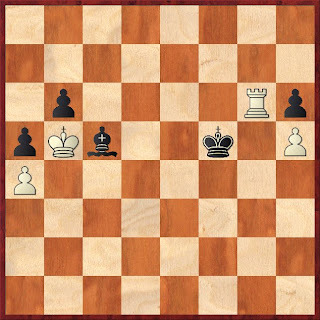 Grivas provides a number of similar examples where the winning side executes a beautiful combination after first driving the enemy king to an "ideal" square. "Wander over to the book and equipment stall of any national chess tournament and you’ll find hundreds of books and DVDs on every conceivable opening, on tactics and puzzles ad infinitum, on mastering the endgame, on game collections and so on. It’s enough to keep the chess junkie browsing until his clock starts for the next round. However, it is rarer to find books that investigate chess culture itself. True, there are plenty of biographies and portraits of well-known players past and present, such as the Kasparov series of My Great Predecessors books and the earlier Profile of a Prodigy. Yet in The Kings of New York, author Michael Weinreb paints a masterful portrait of the vibrant scholastic chess world as it exists in the twenty-first century." This review can also be found in the archives at ChessCafe. 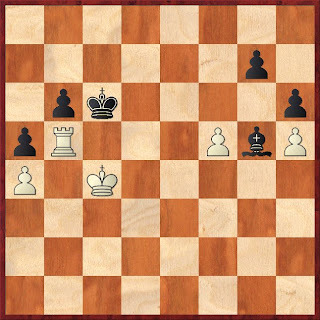 Ace blogger Michael Goeller of The Kenilworthian annotates a fun recent game of his played on the Internet Chess Club. He's got some nice tactical blows, but I'm most impressed with his statement that he used less than 90 seconds of his clock time in winning this game. He finishes his opponent with a rather unusual mating pattern. I had already heard about the flood of passport applications the State Department is reporting, but in twenty minutes at my small local post office, there were four of us applying for passports. One of my sons needs his passport extended - because his current passport was obtained before he turned 17, we had to go in person. The post office staff told us that with standard processing, about ten weeks are needed, but with expedited processing, passports can be obtained within four weeks. If you're thinking about obtaining a new passport or extending your current one, get started early. Here is the website from the U.S. Department of State for more information. In her blog, GM Susan Polgar offers her thoughts concerning some of the reasons why a nation as large as the U.S. produces so few top-level chess players. "There are a number of reasons for this," she says, "but the biggest problem is the lack of a uniform training system. In fact, there is no official system at all." The Boylston Chess Club Weblog reports that Derek O'Dell, president of the Virginia Tech chess club, was injured in the tragic shootings that took place on that campus last week. He reports that he was shot in the arm but says, "I'm doing OK." Our thoughts go out to all affected families. The website for the Virginia Tech Chess Club can be found here. 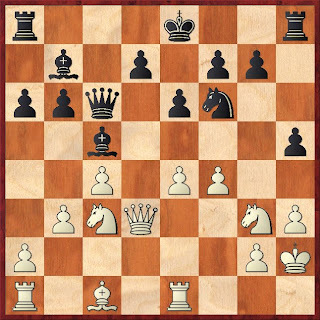 Jonathan Hilton: Part III of "How Wojo Won"
The third and final installment of Jonathan Hilton's analysis of the opening repertoire of the late GM Alex Wojtkiewicz now appears at Chess Life Online. 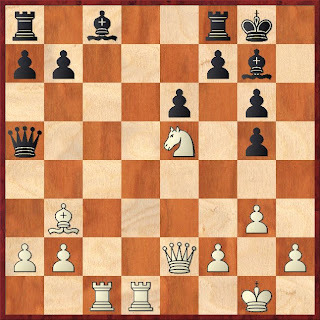 Hilton deeply annotates a King's Indian game and two Grunfeld games. There are a total of eight Josh Waitzkin clips at YouTube as of this writing. You can find them here. 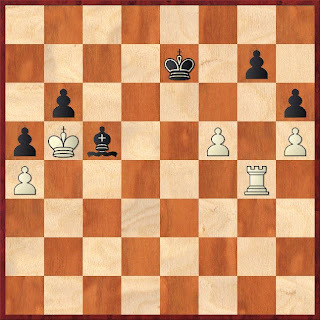 It is White to move and win. The solution can be found here. How Well Can You Count? NM Dan Heisman is out with his latest Novice Nook column at ChessCafe. He presents several examples of simple counting problems. One problem Dan illustrates is rather straightforward, but he notes that "Quite a few intermediate players that I showed it to could not find the correct idea in a reasonable amount of time. This surprising lack of 'tactical vision' once again shows that, even for intermediate players, it greatly pays to improve your tactical vision by studying simple counting problems – along with 'single motif' problems such as removal of the guard, double attack, pins, etc." (Crossville, TN) The 2007 USCF National High School (K-12) Championship broke a record with 1447 young chess competitors in Kansas City, Missouri! The U.S. Chess Federation (USCF) held this 7 round national championship at the Hyatt Regency Crown Center in their new Exhibit Hall April 13-15, 2007. Each player in the five sections: K12 Championship; K12 Under 1500; K12 Under 1200; K12 Under 900 and K12 Unrated played under a G/120 time control. In addition to individual competition, team competition was at stake in each section. All five sections for individuals ended in a time and a variety of tie-break systems were used to determine who would receive the trophy. Players that tied do share the section title of Co-Champions! K12 Championship: Alex Lenderman (NY) won the tie-break against Alexander Barnett (MD) and Michael Zhong after a tied score of 6.5 points. K12 Team Championship: Catalina Foothills H.S. from Tucson, AZ won the trophy after a tie-break with the Edward R. Murrow H.S. from NY. Tied score was 22.0 points. Catalina has won two of the past three National High School Championships! K12 Under 1500: Nick Graves (MN) took home the trophy after a tie-break with Joshua D. Miller of WI. Tied score after seven rounds was 6.5. K12 Team Under 1500: Minneapolis Southwest secured the title of Team Champion, second year in a row, with a final score of 20.5! K12 Under 1200: Dominique Myers and Alfonso Chie tied with 6.5 scores. Myers secured the trophy after tie-break. K12 Team Under 1200: Archbishop McCarthy H.S. from Ft. Lauderdale, FL took the title and trophy with a score of 20.0. K12 Under 900: Mark A. Salita (MD) tied with Deborah Simoes also from Maryland with 7.0 scores. Salita took home the trophy. K12 Team Under 900: Northwest H.S. from Germantown, Maryland secured the title with a final score of 25.5. K12 Unrated: Justin Bernard Braddy of Illinois won the tie-break with Fedor M. Titov also from Illinois to secure the trophy. Braddy and Titov tied with 6.5 scores. K12 Team Unrated: Mcclintock High School from Tempe, Arizona won the K12 Team Unrated title with a final score of 22.0. MyChessPhotos.com (official photographer) awarded a $250.00 scholarship to Caleb Molitoris of California for the biggest upset prize. Caleb rated 1073 beat his opponent rated 2016! The 2007 Bughouse Championship was won by Bughouse Team D. McNall [actually D. McNally - Goldberg] and I. Meerovich who scored 11.0. Results for the Parents & Friends (Non-rated, Rated and Combined) will be available soon. I found the tournament staff to be helpful and courteous, if not always completely knowledgeable (one USCF staffer I spoke with had never heard of the ChessCafe website, and the poor announcer at the awards ceremony had a terrible time with player and school names). The tournament hotel had two major events going on at the same time - the National High School Championship and a girls' dancing group. I saw chess boards and sets strewn all over the place, with kids (and adults) conducting post-mortems and playing blitz, but I didn't see too many ballerinas twirling around the hallways (actually I didn't see any). I met a chess mother from Brownsville, Texas who was touting the universality of chess. "Not everyone has brawn," she said, "but everyone's got brains!" The school coaches definitely appeared more stressed than the players, at least the ones I spoke with. "Chess is tough, man," Catalina Foothills coach Robby Adamson told me during the final round. His team was in the position of having to come from behind to catch the team from Edward R. Murrow after leading the tournament most of the way. "It looks like it could be another heartbreak." At the same time Murrow coach Eliot Weiss paced from board to board, monitoring his players, Catalina Foothills' players, and doubtlessly calculating the various possible outcomes. Despite this tension, there was outstanding sportsmanship displayed. On his way out of the tournament hall following the finish of his last-round game, Sal Bercys of the Murrow squad went directly to opposing coach Adamson and had a pleasant conversation about the last round or two of the tournament. I asked Adamson about this and he replied, "I'm friendly with a lot of the guys. I try not to make it personal unless the other guy makes it personal, and even then, I prefer to just walk away." While waiting for the award ceremony to begin, I spoke with Alex Lenderman of Murrow, and he had only nice things to say about the Catalina Foothills team. I noted that this year was similar to 2005, when Murrow and Catalina Foothills also tied, with the Arizona team winning the title on tiebreak points. "No, this is much better this time, because they have a great team," noted Lenderman. Early into the awards ceremony, a loud announcement rang through the hall. "An emergency has occurred. Please leave the building." Over and over again. People looked around, wondering if this was real or not, but the hall cleared quickly and in an orderly manner. When it was determined that someone had (accidentally??) pulled an alarm switch, the tournament staff jokingly announced that the mass of trophies were up for grabs. "It's first come, first served!" they announced. It was only after the conclusion of the tournament that I took a close look at my press badge. "2007 National Junior High School Championship," it read. I was VERY impressed with the conduct and demeanor of the nearly 1500 kids in attendance. I found them to be respectful to each other and to the adults, and well-behaved. Black kids, white kids, hispanic kids, asian kids, Indian kids, boys, girls, pre-teens and teenagers all intermingled, enjoying the intellectual challenge of chess and enjoying even more the social interaction that the tournament provided. The chess community can be very proud of such competitors. Where else can you find pictures this quickly? The USCF has released its list of qualifying players for the 2007 World Youth Chess Championships, scheduled for November 17-29 in Antalya, Turkey. You can find the information here. The 2007 National High School Championship has concluded with its share of excitement, tension and comedy. In a nail-biting turn of events and mishaps, Catalina Foothills High School of Arizona and Edward R. Murrow High School from Brooklyn traded leads and ended in a tie (again!) for the national championship. As in 2005, Catalina Foothills was declared the winner on tiebreaks. From my vantage point, the competitors played tough but fair and displayed the essence of courtesy and good sportsmanship when all was said and done. After the awards ceremony concluded, Murrow coach Eliot Weiss was being interviewed in a quiet corner by a television reporter and declared, "We'll be here at the end again next year, and so will the Arizona team." Despite both teams losing major players next year to graduation, I wouldn't be surprised if Weiss' words come true. Stay tuned for more details shortly. After three rounds of the 7-round 2007 National High School Championship, perennial powers Catalina Foothills (Tucson, Arizona) and Edward R. Murrow (Brooklyn, New York) stand atop the team standings. Catalina Foothills has 11.5 out of a possible 12 points, and Murrow is close behind with 10.5 points. On their heels is Stuyvesant High School of New York, at 10.0 points. There appear to be some twenty players with perfect 3-0 scores so far in the championship section. This major national scholastic event ends Sunday evening - we'll keep you posted as results are available. You can access the official USCF website for further information. 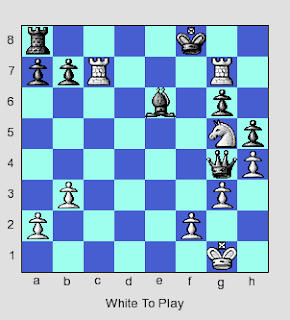 This instruction comes from Fred Reinfeld's 1953 book The Complete Chessplayer. 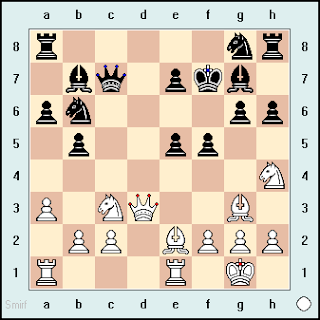 In this starting position, White has a rook and five pawns to Black's bishop and six pawns. 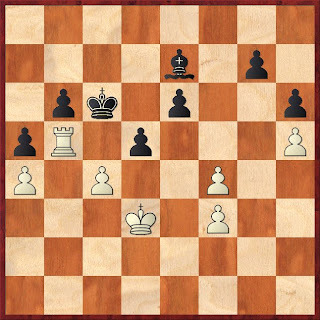 Reinfeld explains that the task for White "is to give the rook mobility, and increase that mobility." He continues, "What will be achieved thereby? The goal will be: weakening Black's pawns to the point where they can no longer be guarded adequately. 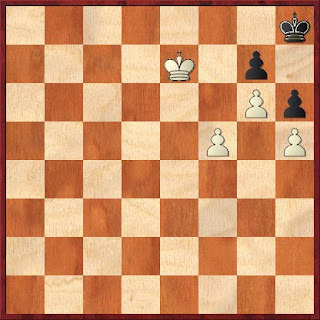 Once this happens, White will win one or more pawns. It will then become possible for him to obtain passed pawns." 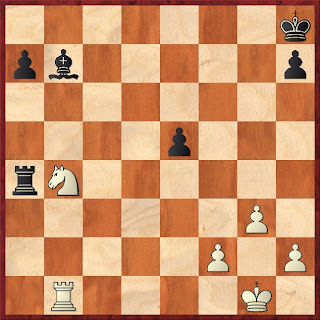 (1) Black has three weak pawns - his king pawn [e6] and knight pawns [b6 and g7]. They are weak because they cannot be guarded by pawns. They must be guarded by the Black king. This obligation imposes severe limits on the Black king's freedom of action. (2) White's rook has at present three [semi-]open files. Nevertheless, he will strive to put even more open lines at the rook's disposal. 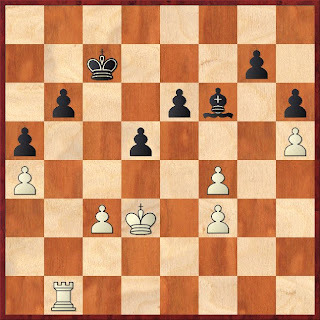 (3) White's king must operate more aggresively and find some way of penetrating into Black's position. 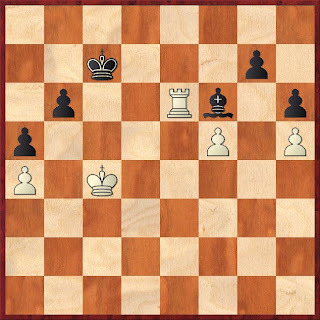 This steady increase of one's mobility and command of terrain is standard position in any ending…Hence White must rely on the simultaneous increase of his own mobility and the cutting down of Black's command of the board. 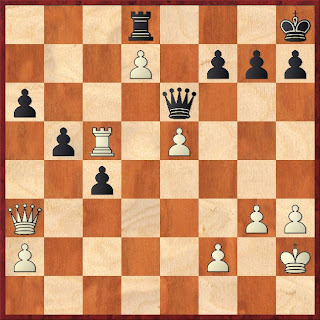 17.Rxh6 and Black resigns, since White can then play 18.Rxb6, sacrificing the exchange for an easily won ending. Chess in Schools teacher and busy chess writer Elizabeth Vicary passes along the information that her former I.S. 318 student Anna Ginzburg placed in clear first in the Under 1800 section of the 2007 Foxwoods tournament. The Foxwoods website can be seen here. My April column at ChessCafe is now available and is entirely devoted to Michael Weinreb's book The Kings of New York. Those of you who will be at the 2007 National High School Championship in Kansas City can find most of the subjects of this book (the Edward R. Murrow chess team) at the tournament. I'm planning on being there as well on the final day, Sunday, April 15. The Evening Telegraph at PeterboroughToday.co.uk reports on the on-going British Land UK Chess Challenge. "In the first stage of the tournament, pupils compete against their friends in school and are awarded points for victories...The players who have progressed to the next round will compete against other top players from across the region and fight for the right to progress to a north versus south event and, eventually, the grand final...More than 70,000 young people across the country take part in the event every year making it the biggest chess tournament in the world." A one-minute video accompanies the article. I always enjoy reading Michael Goeller's original articles over at The Kenilworthian. His recent piece entitled "Chess in the Fourth Dimension" covers some interesting thoughts from Kasparov, Huebner and Rowson, among others. Goeller writes: "It was in R.N. Coles's book Dynamic Chess where I first came upon the idea that chess is a game of four dimensions: material (based on the relative value of the pieces), time (development and initiative), space (control of the board), and position (meaning structural or dynamic weaknesses and strengths in your pieces, pawns, coordination, or king safety). Players typically understand them in that order." You might want to check out GM Yasser Seirawan's latest Inside Chess column at ChessCafe. 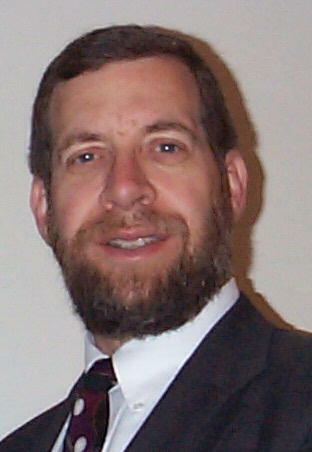 He annotates his 1998 U.S. Championship game against John Fedorowicz. Although it ended in a draw, Seirawan describes it as "One of my most exciting games of the tournament." Elizabeth Vicary has a detailed, insider's look at the recent National Junior High School Championship in her report at Chess Life Online. Several annotated games and multiple photos are included. Although Round 1 games appear to have disappeared for the moment, MonRoi is carrying a number of games from the 2007 Foxwoods tournament live. Follow the games of Sal Bercys, Ray Robson, Robert Hess, Josh Friedel and Daniel Rensch as well as GMs such as Kamsky, Nakamura, Ehlvest, Shabalov, Shulman and others. How Many Polgar Sisters Are There, Again? In a story dated Sunday, 4-1-07, a surprising report at Chessville raises the question of how many Polgar sisters there really are. If it's written on the internet, it must be true, right? MonRoi has a section set up for the upcoming Frank K. Berry U.S. Championship May 15-23, 2007. You can find it here. 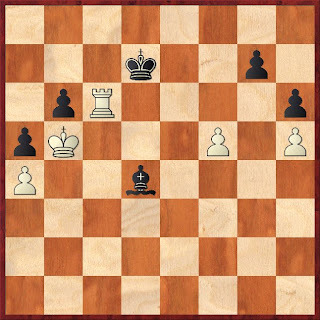 In this position from Fred Reinfeld's The Complete Chessplayer, it is Black to move. 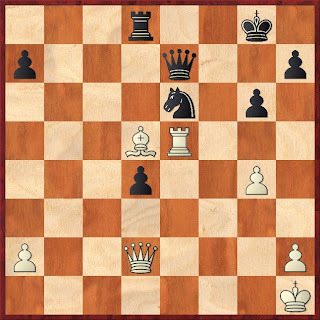 Reinfeld notes that "The pin on Black's knight is extremely troublesome and seems to condemn him to lasting passivity after 1… Rd6." Can you find another path for Black to take? 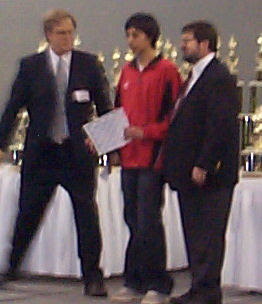 Going into the seventh and final round of the 2007 National Junior High School Championship, Alec Getz had the only perfect score in the K-9 Championship section. He found himself paired with Christian Tanaka, who had only one loss in the tournament. In the end, Tanaka triumphed, resulting in a six-way (!) tie for first among Getz, Tanaka, Steven Breckenridge, Gregory Young, Michael Yee and Grant Ho. Despite the final round loss, however, Alec won the title based on tiebreak points, just ahead of Breckenridge, whom Getz defeated in round 6. As a consolation, Steven Breckenridge finished a full point ahead of his closest competitors in the blitz side event. Congratulations to the more than 1000 players! Next up - the 2007 National High School Championship in Kansas City, April 13-15. Over 1000 youngsters are competing in Sacramento, California at the 2007 National Junior High School Championship. After five rounds, there are two players with perfect scores - Alec Getz and Steven Breckenridge. The two meet each other in round 6. For more information, see this USCF website.